Alien: Covenant is the sixth film in a series that began in 1979 and has made film history. Emanuel Levy looks back at the franchise. It’s impossible to overestimate the impact of the Alien film series – thus far six pictures – over the past four decades. In 1979, a riveting horror movie, Alien, launched a whole cycle of sci-fi-horror features, a genre that was not particularly prevalent or popular. The movie proved seminal in launching a major franchise with three more direct sequels and two more prequels. Alien introduced to the big screen a gifted actress, Sigourney Weaver, who was cast in the kind of role – as tough Officer Ripley – that in Hollywood had been typically assigned to men. The tale is set aboard the Nostromo, an industrial spaceship landing on the surface of a mysterious planet, where the crew discovers a crashed spaceship. Suddenly, a strange egg disgorges a multi-legged life form, latching onto the face of a crewman, Kane (John Hurt). Let the horror show begin – during dinner, in one of the most iconic scenes in film history, a snakelike creature erupts from Kane's stomach and then vanishes. The crew begins to search for the alien, and in the process, other crewmembers are killed. Tension builds up, leading to Ripley's spearheading obsessive battle against the indestructible creature. The Alien movies have always benefited from a small number of well-defined characters. Interestingly, most of them were middle-aged, especially by standards of the sci-fi genre. Though no actor was a major star (Weaver would become a household name after this picture), they were experienced British and international actors with impressive resumes on screen, stage and television. There was also novelty in the gender ratio: two of the seven crew members were women; Veronica Cartwright was the other. The decision to make the lead character a female was “revolutionary,” wishing to deviate from the norm of the otherwise male-driven sci-fi. Weaver, a grad of Yale School of Drama (same Alma Mater as Meryl Streep), had appeared on Broadway but she was an unknown quantity in film. Ripley became Weaver's first leading role, with which she is still intimately associated, having appeared in four Alien chapters. She would win one of her two career Golden Globes for her role in Aliens. Ash, the ship's science officer (later an android who betrays the crew), was played by the Brit actor Ian Holm. John Hurt, just before being cast in David Lynch's The Elephant Man, was Kane, the executive who later becomes host for the Alien. American thesps Tom Skerritt was Dallas, the captain of the Nostromo, and cult actor Harry Dean Stanton was the engineering technician. The antagonist was played by Bolaji Badejo, a tall (over 7 feet) and slim Nigerian student. The movie’s novelty has largely derived from the central mysterious character – the mutating creature. You never knew what form and size it would take and where it would come from, which made viewers sit at the edge of their seat, dreading the scenes to come. Essentially, the Alien movies borrowed the concept of the “haunted house" – except that now the house was a moving spaceship. Swiss artist-designer H. R. Giger supplied the film’s distinctive "bio-mechanical" concepts, making the creature one of the scariest to be seen on screen. A synthesis of humanoid form, insect-like look and mechanized structure, the creature was never seen clearly, which, of course, added to the suspense. Alien was nominated for the Art Direction-Set Decoration Oscar and won the best Visual Effects award for Giger and his team. Alien also put on the map Ridley Scott, the relatively young Brit director, who in 1977 had made his debut with The Duelists. Scott made a clever use of the genre conventions, adding to them original special effects. He has directed three of the six movies. Made in 1986, James Cameron's Aliens, the second film, was based on a script by Cameron, Walter Hill and David Giler. It centers on Ripley, who's been unconscious for 57 years. Under orders from an industrial company, she is assigned the task of investigating the disappearance of colonists on the aliens' planet. The two films, reflecting the respective sensibilities of their directors, are vastly different. Drawing on conventions of the sci-fi horror, Aliens was high-tech (as most of Cameron's pictures) and contains spectacularly staged set pieces. 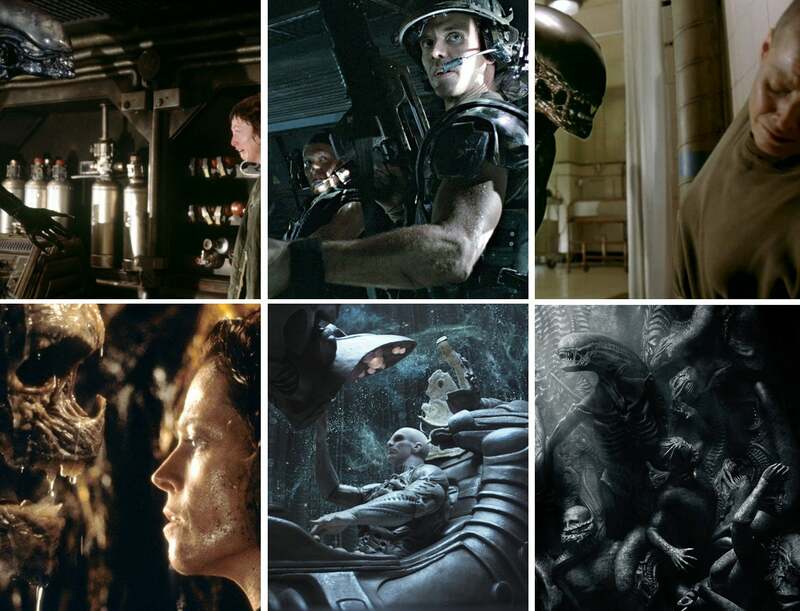 Shot by different cinematographers, the two movies also have a distinct visual look: Adrian Biddle shot Aliens, and Derek Vanlint the first. In Aliens Weaver was supported by Bill Paxton, Paul Reiser, Michael Biehn, Lance Henriksen and Carrie Henn, a young girl named Newt, the planet's only survivor and who reawakens Ripley's maternal instincts. The first film conformed to the conventions of a horror movie and is still the most terrifying. The gory violence – utterly unpredictable – mattered because the characters were interesting; we cared about them. Aliens was a nonstop slam-bang, super-tech action-adventure, stamped by the auteurist signature of Cameron (then known for Terminator 2). It also featured the longest climax – the whole movie was practically a climax. The visual imagery and gloomy tone of the 1992 Alien3, which was helmed by David Fincher, were the main attributes of the third panel, with continuity provided by the tough Ripley (again Weaver). In this movie, Ripley crash-lands on Fiorina 161, a hostile prison colony, populated by vicious murderers and rapists who now subscribe to a mysterious religion under the leadership of Dillon (Charles Dutton). All alone, with no survivors from the previous movies and no weapons, Ripley is pitted against the ugly, salivating monster that keep attacking the compound. Alien 3 is noteworthy for its visual conception (cinematography by Alex Thomson) and art direction. The dominant images of long, dark tunnels and burning furnaces are ominous and in line with the film's subtext. Fincher, who was making his feature debut, hailed from music videos (Madonna's best videos), which accounts for the emphasis on tone and look. A grim tale with overtly religious overtones, Alien 3 was also read as a metaphor for the then rampant AIDS crisis. Alien Resurrection, in 1997, was directed by Frenchman Jean Pierre Jeunet as the series’ fourth installment. Scripted by Joss Whedon, the story is set two centuries after Ripley's death, when doctors aboard the space station Auriga try to clone her by using blood samples taken from Fiorna 161. They hope to get the queen embryo, incubating inside Ripley when she was on the remote planet. But, alas, Ripley’s clone gains consciousness and begins to display human skills. A standoff between the pirates and the military is aggravated by the chaos caused by the aliens breaking free of their cells. With the fate of mankind hanging, Ripley is captured by the aliens, coming face-to-face with the mutated results of the scientists' experiments. Jeunet, a respected French director with quirky visual sensibilities (best known for the 2001 hit, Amélie), was a strange choice for this material. Thus, Alien Resurrected became the least commercial of the series to date, which may explain why it took15 years for the next movie, Prometheus, in 2012, and then another five for the current one, Alien: Covenant, both of which directed by Scott, and starring the estimable Michael Fassbender. Collectively, the Alien movies have breathed energetic life into a new hybrid genre, the sci-fi-horror-actioner, resulting in numerous pale copies and imitations.